A stroll through Neolithic Anglezarke, this takes in sites that are older than the Egyptian pyramids, way back to the Stone Age! Evidence of prehistoric occupation of the local moors was made during the early 1950’s, when, following a systematic search of the moorlands several flint tools were found. Further work revealed chipping sites where flint pebbles were worked to produce the tools and flakes. The period generally associated with these finds was ‘Bronze Age’, but their is a possibility that some of these flints could be from the earlier Mesolithic Period. This walk is never steep, but the views are outstanding, taking in two lesser-visited peaks, due to the challenging Right To Roam nature of the walk, with only a small amount of the tracks on official footpaths. Don’t blindly follow the arrow, you may end up in Devil’s Ditch! Parking is at Jepson’s Gate – there is room for about three cars here. 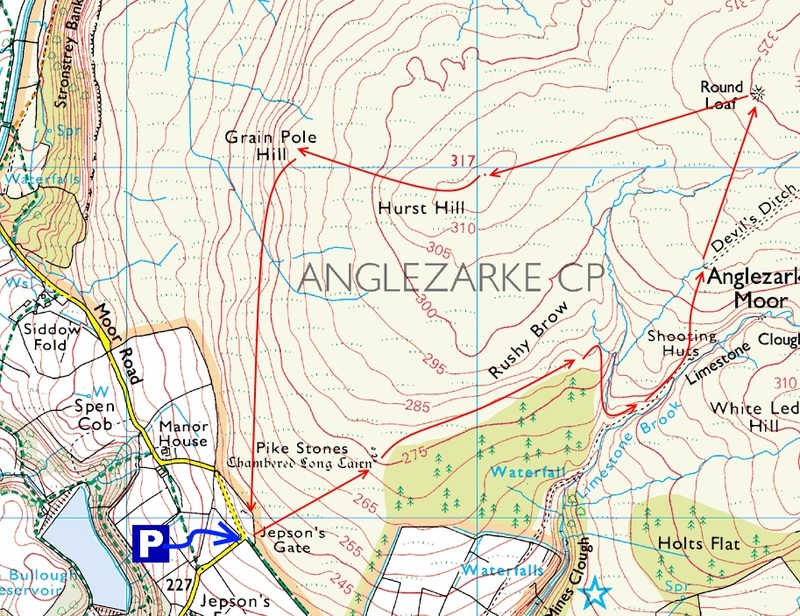 You will see the well-made track heading in the direction of Rivington Pike, but instead head sharp left (North East) over the stile, and up the rougher farm track towards the distant corner of woodland. Much of this walk is dead-reckoning, heading straight ahead where possible, but taking into account the ground conditions. Here, you want to head just to the left of the woodland uphill and ahead. You will come to the site of Pikestones, which is over a stile and the first remote spot, one not commonly known to local folk, but it contains an interesting burial mound. It is a shame it is not better preserved. After mulling over the spot, continue to the next stile, on the opposite side of the Neolithic remains. Follow the line of the trees round to the right, looking out for further evidence of ancient activity – there are rumoured to be further cairns here, along with standing stones and ditches. At the end of the woodland, you will reach a rough T-junction in the track, with a valley ditch in front of you. Follow the slightly better path to the right, around the woodland, enjoying this peaceful side of Lead Mines Valley. At the end of this well-trodden path, you will reach a modern, man-made gravel track. This T-junction is the site of James Yates’ Well, a spring of much repute. Turn left here, keeping the river to your right. Follow this new river fork gently uphill, until you see a faint track up to your left. The actual track starts off at the site of Shooting Huts – the most modern “ruin” on this trip, but there is no evidence whatsoever, and nothing to waymark the spot. Here, you are following a peaty walk across the moors, walking gently uphill basically until you see Round Loaf itself, an unmistakable tumulus on the moors. Once it is in sight, you can follow the nearest track straight to it. Once you arrive at Round Loaf, you can admire the 360-degree views, including Darwen Tower, the whaleback of Great Hill, and the numerous Anglezarke landmarks. You are bang in the middle of the moors now! Turn towards the coast to the gentle hill in the distance, and dead-head towards it, taking care over the boggy ground. You will arrive at the rolling summit of Hurst Hill, with two cairns. This was the site of the crash of Bomber Zulu 8799. This, for me, is the greatest viewpoint of the moors. Next, head for the heathered peak of Grain Pole Hill which is a continuation of direction, and a slight lowering in height, but unmistakable ahead. This spot has fantastic views over Healey Nab, offering a different perspective to Hurst Hill prior. From here, it’s a case of “simply” heading straight back to the parking spot, trying not to get caught in the tussocks and ditches!